On 7 June 1774, William, Duke of Devonshire, married Georgiana Spencer, a young, charming, and fashionable lady full of hopes for the future. Georgiana was aware that her main job was to provide her husband with a heir, and possibly a spare too, but little did she know that she would be required to raise his natural daughter too. The day the couple married, the Duke’s mistress Charlotte Spencer (no relation), a former milliner, was nursing her newborn daughter, another Charlotte. Although, technically, the baby was conceived before the marriage, William kept seeing Charlotte even after his wedding. He made sure both his mistress and their child lived comfortably in a decent home and he even hired a nurse, Mrs Gardner, for little Charlotte. Things went well until 1778, when the Duke finally tired of his mistress. Shortly after he dumped her, Charlotte died. Life was not easy for an illegitimate and motherless child, and who knows what might have happened to Charlotte if William hadn’t taken both her and her nurse into her home. She is a very healthy good humour’d looking child, I think, not very tall; she is amazingly like the Duke, I am sure you would have known her anywhere. She is the best humour’d little thing you ever saw, vastly active and vastly lively, she seems very affectionate and seems to like Mrs Gardner very much. She has not good teeth and has often the toothache, but I suppose that does not signify as she has not changed them yet, and she is the most nervous little thing in the world, the agitation of coming made her hands shake so, that they are scarcely recover’d today. Georgiana always treated Charlotte as her own. This was such an unusual behaviour that sent many tongues wagging, but Georgiana didn’t care. Instead, the little girl, who had no surname, was given the last name of Williams (naming illegitimate children after their father was a common practice at the time), and introduced the girl to anyone as an orphan relation of the Spencers. When she was nine years old, Charlotte got a new governess, Elizabeth Foster, Georgiana’s frenemy and the Duke’s would-be mistress. The arrangement seemed to suit both Elizabeth, who would both be closer to the Devonshire family and receive a stable income, and to Charlotte, who had not thrived under the care of Mrs Gardner. Soon after the decision was taken, the two departed from France. This would allow Bess to heal from her cough (the gentler climate was supposed to do her good) and Charlotte to refine her education. The Devonshires, though, would soon regret their decision. Bess soon got bored with her job as governess and started partying her way through Europe, dragging the shy Charlotte with her. But, in Naples, she went too far. She, and Charlotte, moved in with two of her lovers! When Georgiana found out, she was horrified. Rather than turn Charlotte into a refined lady, her time in Europe with Bess had traumatized her. Bess lost her job, and Charlotte was sent to Paris to further her education. She returned home shortly after the revolution broke out. In 1794, Charlotte married the Duke’s agent’s nephew. Sadly, from this point on all traces of her disappear from the historical record. Not even her face was recorded. 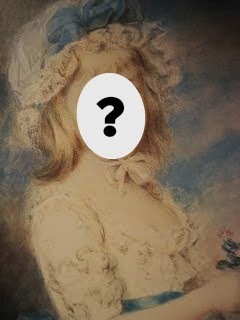 No known portraits of her exist. We can only hope that she led a quiet and happy life with her husband.